Some chefs decide early on that this is the career path for them; Pastry Chef Laurie Jon Moran is one of them. His inspiration for a career stemmed from an 18th birthday at the illustrious two-Michelin starred Le Manoir aux Quat' Saisons in his native Britain. 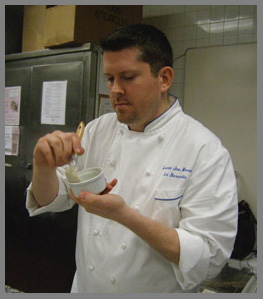 Living in the United States since 2004, he has honed his craft working with at top New York restaurants alongside pastry chef notables such as Dominque Ansel and Michael Laiskonis. 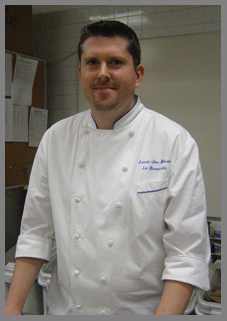 He has been the Executive Pastry Chef at the three-Michelin starred Le Bernardin since 2011. 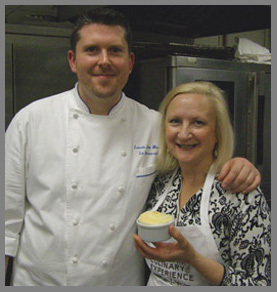 I had the opportunity to meet and get to know Chef Laurie Jon Moran while mastering the art of making perfect soufflés during his class entitled, Soufflés, Not as Scary as You Think, during the 2013 New York Culinary Experience. He advised the class that while many people do not attempt soufflés because they think that they are too difficult to make, that is really not the case, and that they can be the ideal dinner party dessert because you prepare everything in advance and then bake them just before serving. The secret is to have everything you need set and ready, understand what you need to do, and have a great recipe. 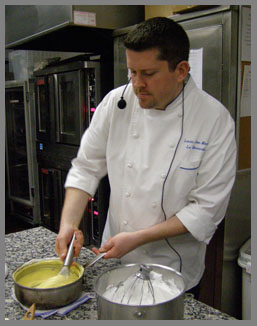 Pastry Chef Laurie Jon Moran graciously shares four of his soufflé recipes: Roquefort Cheese Soufflé, Grand Mariner Soufflé, Passion Fruit Soufflé, and Chocolate Soufflé that we made during the class. 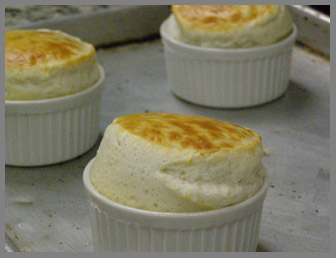 Method for preparing the soufflé molds: Lightly brush the insides of 4 4x2 inch soufflé molds (ramekins) with room temperature soft butter, ensuring the molds are evenly covered. Method for the soufflé: Mix the egg whites and egg white powder lightly and leave to rehydrate for approximately 20 minutes. Mix the milk, spices, and cornstarch. Over a medium heat, bring the mixture to boil in a pot, whisking continuously. Meanwhile, start whipping the egg whites, sugar, and salt on medium speed. Once the milk base has come to a full boil, turn off the heat and leave the pot on the stove to stay warm. Add the Roquefort cheese, and stir the base with the whisk occasionally to prevent a skin from forming. Once the egg whites are at the soft peak stage, turn the speed up to medium high. When the meringue has reached medium peak stage, stop whipping and beat approximately one-fourth into the base in the pot, then fold the lightened base into the remaining meringue. Fill a piping bag with the mixture and pipe into the prepared soufflé molds, filling them 4/5 full, and bake at 350° Fahrenheit (176° Celsius) for approximately 8 minutes. Method for preparing the soufflé molds: Lightly brush the insides of 4 4x2 inch soufflé molds (ramekins) with room temperature soft butter, ensuring the molds are evenly covered. Liberally dust with sugar. Gently shake out excess sugar. Method for the soufflé: Mix the milk and the cornstarch, and then add the orange zest. Over medium heat, bring the mixture to boil in a pot, whisking continuously. Meanwhile, start whipping the egg whites on medium speed. Once the milk base has come to a full boil, turn off the heat and leave the pot on the stove to stay warm. Add the Grand Mariner, and stir the base with the whisk occasionally to prevent a skin from forming. Once the egg whites are at the soft peak stage, turn the speed up to medium high and begin adding sugar a little at a time. When the meringue has reached medium peak stage, stop whipping and beat approximately one-fourth into the base in the pot, then fold the lightened base into the remaining meringue. Fill a piping bag with the mixture and pipe into the prepared soufflé molds, filling them 4/5 full, and bake at 350° Fahrenheit (176° Celsius) for approximately 8 minutes. Method for the soufflé: Mix the puree and the cornstarch. Over medium heat, bring the mixture to boil in a pot, whisking continuously. Once the passion fruit base has come to a full boil, turn off the heat and leave the pot on the stove to stay warm. 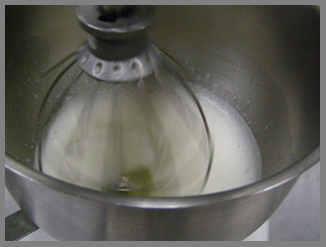 Whisk occasionally to prevent a skin from forming. Method for the soufflé: Mix the milk and the cornstarch. Over medium heat, bring the mixture to boil in a pot, whisking continuously. Melt the chocolate in a bowl over a pot of simmering water. Once the milk base has come to a full boil, turn off the heat and pour the chocolate into the pot but do not mix into the base. Leave the pot on the stove to stay warm. Once the egg whites are at the soft peak stage, turn the speed up to medium high and begin adding sugar a little at a time. Add the egg yolks to the pot. 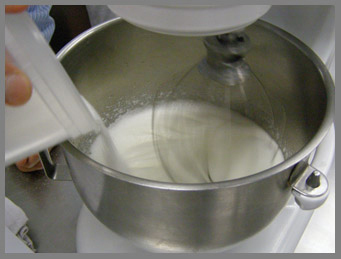 When the meringue has reached medium peak stage, stop whipping and beat approximately one-fourth into the base in the pot, then fold the lightened base into the remaining meringue. Fill a piping bag with the mixture and pipe into the prepared soufflé molds, filling them 4/5 full, and bake at 350° Fahrenheit (176° Celsius) for approximately 8 minutes. Read about the class, Soufflés, Not As Scary as You Think, and about the other classes in the Gastronomy section and interviews and recipes from the other classes in the Chefs' Recipes section.